Though the martial art discipline of Judo is known as a gentle form of self-defense, make no mistake about it. Competitors in the annual Tortola Judo Club Tournament would endure choke holds, body slams, bruises and scrapes in intense three minute bouts that would pit the territories finest young competitors against each other for a chance to win the lightweight, middleweight, or heavyweight division. For parents, the sight of seeing their child in a choke hold with their face turning bright red can be nerve wracking. Heart rates increase as seconds turn to minutes waiting for their loved one to escape or for the ref to call time. Worse is the unmistakable sound of a body being slammed into the mat during an explosive Judo maneuver. Yet, each athlete has spent hours training how to fall and defend themselves in these situations. Technique, mental discipline, physical toughness, and strategy would be employed as athletes battled for the huge trophies that awaited the winners. However, three distinctly different strategies would be used by the division winners enroute to their respective victories. Judo originates from Japan so it was fitting that stand out student, Tak Wood of Japenese descent would wow the crowd in the lightweight division. As the highest ranking belt in his weight class, Mr. Wood implemented a cautiously aggressive approach to minimize his competitor’s strengths and at the same time utilize his deep repertoire of skills to his offensive advantage. The highly talented Wood showcased a wide range of throws and holds that not only kept competitors on edge but the officiating crew as well. Refs had to take particular care to watch for such advanced maneuvers as arm locks – a ground game technique that produced a couple of victories for the young athlete. Mr. Wood decisively fought his way to become the Lightweight Champion. a number of Judo throws and was determined to utilize any he could in an unrelenting offensive strategy that immediately put competitors on the defensive. In the rare times that MacCallum was at disadvantage his mental discipline allowed him to maneuver out of harm’s way. MacCallum would dominate the middleweight division earning him first place. Unlike the Light and Middle Weight Divisions whose winners held the highest belt designation of their class, John Pettigrew found himself at some disadvantage. With competitors some 25% heavier in weight and holding higher degrees of Judo certification, Pettigrew had to develop an entirely different strategy. Letting his opponents take the offensive Pettigrew opted for a cautious, yet calculated approach as he utilized his longer arm and leg reach to stay clear from the power zones of his competitors and conserve energy for opportune moments. His strategy began to pay off as the heavy competitors began to tire allowing Pettigrew’s “off mat” conditioning through running and cycling to work to his advantage. As competitors fatigued, Pettigrew capitalized in key moments as he methodically threw his opposition to the mat and used his ground game to employ choke holds to gain victory. Pettigrew would remain undefeated in his five bouts and would claim the Heavyweight Title. While some athletes would emerge victorious, others would “tap out” in defeat, many would fight to a draw, but all would finish the tournament with no major incidents thanks to their preparatory training. 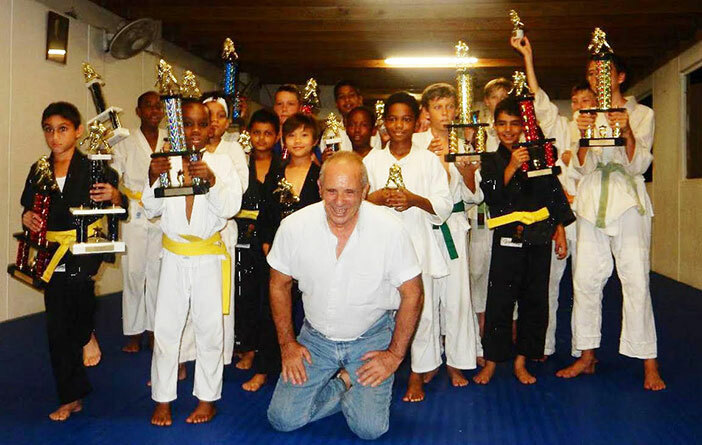 Their instructor is Sensei Mark Hooper, a 5th degree black belt and certified examiner who has tirelessly given back to community in his decades of training what has now become generations of students. The Dojo now provides the territory with a martial arts training facility open for Judo and other disciplines. Participation costs for the Club are a modest $25 per month and includes lessons several times a week and is open to all.